Do you often commute by driving everyday? If so, you may be a royal user of Google Maps too. It offers the most accurate navigation service. But honestly it doesn't contain all features previously. If you enjoy listening to music, news, you will have to switch to other apps. This is not convenient or safe. Fortunately, recently Google has a big redesign of its maps with the "Commuter-focused" features such as the in-app music support and new commuter tab. Now I will show you more details about the update and take iPhone for example to you how the "Music Controls" feature works. Google	Maps	is a web based service that provides navigation for drivers, location for GPS systems and street view for any users who want to learn more about their city. It works well on both Android phones and iPhones. There are multiple new features added since its debut. Following are the latest features. This feature incorporates live traffic and transit data. To set up the commute, just tap the "Commute tab", it will ask you a few questions. You can select the answers by following the screen instruction. When it is done, it will inform you the best time to leave for work and home. You can avoid the traffic jams easily. Driving alone could be boring. So why not get some music to cheer you up? With this in-app music integration, you can easily play songs, albums, podcasts and playlists from Apple Music, Spotify, Google Play music on the same navigation app without switching to other apps. Want to let your loved one to know your live location info? It has never been easier on the new Google Maps. Just tap the "˄" button once you have launched the Navigation and click "Share trip progress". If you are driving an electric vehicle, you don't need an extra app to help you. Just search "EV charging", it will display all the nearest EV charging stations. Of all the features, the "In-app Music Controls" is the best feature I like. With it, we don't need the Apple CarPlay or Google Android Auto anymore. To get started to use the feature, please make sure you have updated Google Maps app to the latest version on your iPhone or Android phones. 1. Launch Google Maps app on your iPhone. 2. Click the small gear icon from the top left side > Click “Navigation" menu > Tap "Music Playback Controls". 3. By default, it is set to "None". Please click it and then choose the preferred media player as "Apple Music". 4. It will prompt you the message asking the permission to access to your Apple Music Library. Please click "OK" to accept. 5. 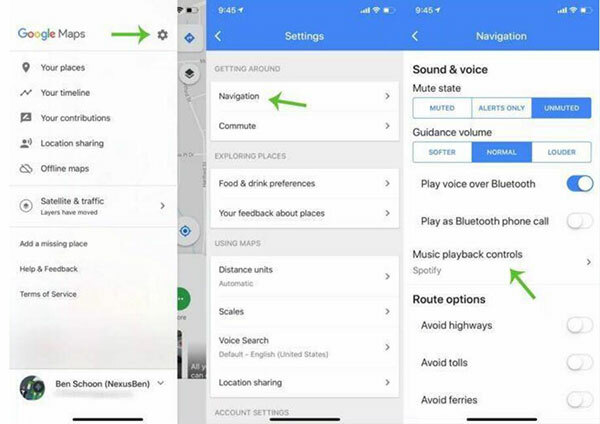 The Apple Music playback controls will appear on the bottom of Google Maps during navigating. 1. Launch Google Maps app on an Android phone. 2. Tap the menu button from the top left corner > Click "Settings" > Click "Navigation Settings" . 3. Toggle the "Show media playback controls" button on. 4. Tap "Sound & Voice" > Tap "Music playback controls" > Select the "Apple Music". 5. 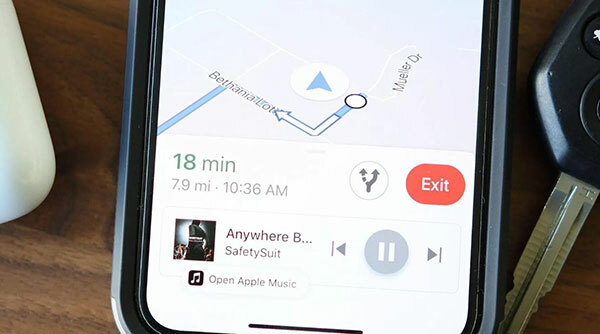 Now when navigating on the Google Maps, you can browse the Apple Music songs, playlists to play directly. If you are an old user of Apple Music, you should have already curated a lot of favorite playlists for driving by yourself. But if you are new to Apple Music, don't worry, you can take a look at these best road trip playlists. Spring is coming. To celebrate the end of cold winder, you should definitely have a trip with your families. These Spring road trips songs will offer you warm and comfortable feelings. No matter where you live, you may miss the romance of country road and the wonderful melodies. In this playlist, you will find the best country music from Taylor Swift, Miranda Lambert and Carrie Underwood and so on. Want to get high when you are in the car? Listening to rock music will be one of the best ways. From the classic outfits like Queen and Van Halen to modern rock playlists will be loved by anyone. That is it. You should have already learned all the best driving songs and the tips to set up Apple Music on Google Maps. Why not get started to use it today? Let's know what you think about this new feature of Google Maps.